Berthoud Pass was named for Captain Edward L. Berthoud, who completed the first survey of this saddle in the main Divide in the spring of 1861. Berthoud’s expedition of eight people, including Jim Bridger, crossed the Continental Divide at the 11,315 foot summit and established a relatively easy way to get into Middle Park from the east. Berthoud also served as chief engineer on the Colorado Central Railroad. It is surprising that this famous pass had played no previous role in the history of the region. Even Jim Bridger, who knew the country well, did not learn of its existence until the survey. For reasons of their own, Indians had chosen to go over the divide at higher levels further to the north. One explanation may be that the pass is not evident from most locations on either side of the Continental Divide. 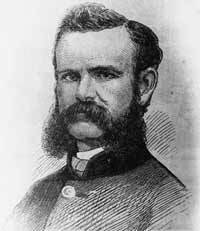 On May 24, 1869, Major John W. Powell embarked on an expedition to fill in the final unknowns on the map of the American West. Among his nine-man crew were five veterans of the Civil War from Middle Park, unaware that by joining Powell’s discovery expedition they would find their own immortality. Corporal John "Jack" C. Sumner served in Company E, 32nd Iowa Volunteer Infantry in the Civil War. His sister Elizabeth Byers brought him to Colorado in 1866. W.N. Byers, editor of the Rocky Mountain News, employed Jack as caretaker of the Middle Park Hot Springs. Sumner set up a trading post for hunters and trappers. Bill Dunn, Billy Hawkins, Oramel Howland, and Seneca Howland were all customers. Major and Mrs. John Wesley Powell visited the springs in 1867. Nearby, the headwaters of the Grand River flowed. Powell and Sumner planned to navigate the Grand, Green, and Colorado Rivers to the Gulf of California. Sumner convinced his colleagues to join the Colorado River Exploring Expedition. Only Sumner made it to the Gulf. He died July 5, 1907, leaving a widow and three sons. Private William H. “Bill” Dunn served with Co. K, 15th Ohio Vol. Inf. After service, he came to Colorado. Powell said of Dunn, “He dresses in buckskin with dark luster, and has a contempt for razors and shears.” Dunn left the expedition at Separation Rapid, Arizona, and was subsequently killed. No photos of Dunn exist today. Artist’s interpretation courtesy of Hannah George. Oramel G. Howland was a printer at the Rocky Mountain News, and VP of the Typographical Union. He was associated with the Methodist publication The Sunday School Casket. Powell said Oramel had a “King Lear” look. At age 36, he was the expedition’s mapmaker. His fate was the same as Dunn’s. Pvt. William R.W. “Billy” Hawkins enlisted with Company D, 15th Missouri Vol. Cavalry. Hawkins came to Colorado as a bullwhacker. He was the expedition’s cook and last survivor, passing away in Arizona at age 70, on June 7, 1919. A half-brother of Oramel, Seneca B. Howland was a member of Co. G, Vermont Vol. Inf. Brigade. At age 26, he shared the same demise as Oramel and Bill Dunn. 2019 marked the 150th Anniversary of the Powell Expedition. The rounded mountain at the head of the East Inlet to Grand Lake has born many names-from Middle Mountain, to Mount Baldy, to Mount Westcott. It's official title, however, is Mount Craig. It's namesake is The Reverend William Bayard Craig, who came to the area in 1882, to be pastor of the Central Christian Church in Denver. He visited Grand Lake occasionally, and completed some real estate dealings there. The town of Craig also bears his name, due to the influence of his friend, David Moffat, of the Denver and Salt Lake Railroad. While the origin of the names of many mountains in Grand County has been lost to history, we do know the source of many of the more notable mountains. 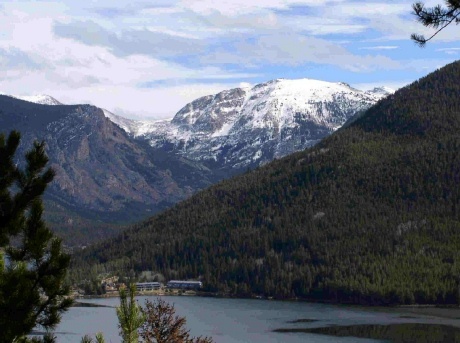 The name originations of some mountains of Grand County are as follows: Adams Peak – Named for either Jay E. Adams who owned a cottage in Grand Lake or Alexander and Louise Adams, original owners of the Grand Lake Lodge. Mount Alice – 13,110 ft. – Named in 1911 by request of geologist Dr. William S. Cooper. Who “Alice” was, was not explained. Arapaho Peak – Named for the Arapaho Indian tribe who frequented Grand County during hunting season. Arikaree Peak – Named for the Arikaree Indian tribe by James Grafton Rogers in 1955. Baker Mountain – Named for John Baker from Indiana, a well known prospector and hunter of the 1850’s and 1860’s. Bills Peak – Named after an early settler in the area whose last name was not known. Bottle Mountain – Named for the bottle shape of the mountain, three miles north of Byers Peak. Byers Peak – 12,790 ft. – Named for William N. Byers, publisher and editor of the Rocky Mountain News and early promoter of Hot Sulphur Springs. Mountain Cairns – 10,800 ft. – Named for James Cairns, first storekeeper at Grand Lake. West Carter Peak and North Carter Peak– Believed to have been named for a member of the original U.S. Geological Survey team. Cascade Mountain – Also known as Loder Mountain, popularly named for cascading stream. The Cleaver – Believed named by early settlers for location between two other peaks. Coal Mountain – Named for visible coal seam. Mount Cumulus – 12,725 ft. – Named for cloud formation resemblance. One of three “cloud” peaks. Diamond Mountain – Named for rumors of diamonds found there or its shape. Located four miles East of Muddy Pass. Mount Epworth – Believed named for a Methodist youth group founded in 1889. Located east of Rollins Pass. Fairview Mountain – Named for scenic view. Located ½ mile south of Parika Peak. Mount Flora – Named for fields of flowers on mountain. Mount George – 12,876 – Named for Dr. R.D. George, a geologist. Its north spur is Lone Eagle Peak. Green Mountain – Named for the green trees covering the mountain. Grouse Mountain – Named for the grouse that inhabit the area. Hallett Park – 12,713 – Named for William H. Hallett who lived from 1851 to 1947. The mountain was named in 1887. Howard Mountain – Named for John Howard, a prospector. The mountain was named in 1880. Mount Irving Hale – Named for Brigadier General Hale who lead Colorado troops in the Philippines during the Spanish American War. Hale was a member of the first graduating class at Denver High School and won an appointment to West Point. Camp Hale, near Leadville, was a training site for World War II ski troops and was also named for him. Rollins or Corona - What shall it be called? Travel across various passes of the Continental Divide occurred long before white men showed up. Indeed, as anthropologist James Benedict wrote c. 1975, some 10,000 years ago, prehistoric Indians camped, hunted, and built hunting walls on the upper reaches of Rollins Pass, as well as moving in and out of Middle Park for the warm summer months. Historic Indians followed the same paths. In the earliest days of non-Indian access, a particular pass at the head of Boulder Creek was dubbed Boulder Pass. Capt. Jacob Bonesteel, including wagons, made the first recorded crossing by a white man at this point in April 1862. Three years later, a group of Mormons brought wagons over this route and a year later, promoters of new roads into Middle Park brought in many wagons and livestock. In fact, tourists were starting to enter the park by a number of routes, and one of them, Samuel Bowles, who wrote a fascinating account of his trip, including his return to Denver via Boulder Pass. Interest was growing rapidly for a road over the Divide, into Hot Sulphur Springs, and on into Utah. One promoter, John Quincy Adams Rollins, from New Hampshire, teamed up with William N. Byers and Porter M. Smart to carry this project through. Rollins was interested in crossing the Divide; Byers was promoting the Springs; Porter wanted to develop the valley of the Middle Yampa. All three were pushing to have Middle Park officially named as Grand County, a challenge finally accomplished in 1874. So Rollins and associates started his road, reaching the top in 1873. That next winter, they publicized this access and in June, Jimmy Crawford brought his family and wagons to Rollinsville and thence to Yankee Doodle Lake, ready to cross the pass now named Rollins Pass by the developer. But the road ended, and they found Rollins' men still hacking the road out of the granite! Jimmy and his crew found it necessary to leave their wagons and help. Finally, on June 10th, the family was able to head for the top. Jimmy borrowed two yokes of oxen, hitching them to mules, and then to his horse. The road was so rough that the procession could proceed but a few feet before having to rest. The family itself climbed on foot. At the summit, they discovered only a rough swath cut down through the trees on the western side. The "road" dropped down between the lakes and followed Ranch Creek to its junction with the Fraser River. Rollins quickly realized that Berthoud Pass, which also opened in 1874, was superior to his own pass for wheeled vehicles, so he determined to hedge his bets. He initiated the first mail service into the county in 1873. He also built a commodious hotel where his road joined the Berthoud Pass road at the confluence of Crooked Creek and the Fraser. He called it the Junction House. Next, he proposed to the builders of Berthoud Pass that they form a joint ownership of the two roads between Junction Ranch and the Springs. Tickets would be issued for both routes and revenues would be shared. The two companies would build a bridge over the Grand at Hot Sulphur Springs. He even buttered up his rivals by complementing their work. All this was accomplished, although the mail route soon moved to Berthoud Pass, because of the severe winters on Rollins Pass. The bridge was started in November 1874. From the beginning, Rollins' road was preferred for trailing livestock, because there were fewer problems with heavy timber and bogs. For years, the Church brothers, George and John, who introduced the Hereford breed into the county, trailed their cattle for summering in what became known as Church Park. 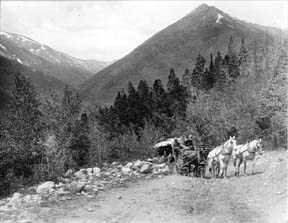 However, tourists such as Irving Hale still drove wagons over Rollins Pass in 1878. About 1880, interest burgeoned for bringing a railroad up South Boulder Canyon and through a tunnel near Rollins Pass. Numerous surveys were completed all along the area. David Moffat settled on Rollins Pass for the tunnel site but decided first to put a temporary line over the top. Thus, in the summer of 1903, a formal contract was let for work up and over the Pass itself. By 1904, the workers reached Arrowhead and they also built a work station on top, called Corona Station, or "crown of the mountain." This railroad construction town of Corona, located at over 11,600 feet at the top of Rollins Pass (first called Boulder Pass) along the Continental Divide was the highest railroad station in the world. It became obvious by 1905 that the Corona area would require snowsheds if trains were to travel, even irregularly, during the winter. Still, word got out of the spectacular splendor of Rollins Pass and tourists flocked in on summer train excursions, sometimes stopping on top, sometimes going as far as Arrow. In 1913, a fine hotel was built next to the rail facilities. Because Rollins Pass was right in the middle of severe weather patterns, a weather station was built on top, as well as one down at Sunnyside. In 1915, Rollins Pass was actually proposed to be the south boundary of a proposed "Estes National Park." Later, on the National Historic Register, the district was listed in 1997 as the Denver, Northwestern and Pacific Railway Historic District--Rollinsville & Middle Park Wagon Road. It was also identified as the Rollinsville and Middle Park Wagon Road; Boulder Wagon Road, Rollins Pass, and Rollinsville area. In 1956, Governor Steve McNichols had presided at the official re-opening of the four percent grade to vehicle traffic over Corona Pass, expressing the hope that the route would someday be paved. The Colorado Game and Fish Department and the U.S. Forest Service made additional improvements, and the Arapaho and Roosevelt National Forests put out a 24-page booklet titled "The Moffat Road: A Self-Guiding Auto Tour." The road crossed two of the original railroad trestles near Corona but those trestles, even if reached by 4-wheel vehicles, were crumbling and could no longer even be crossed safely on foot. The current self-guided auto tour refers to Rollins Pass, as well as the Moffat Road and the Boulder Wagon Road. Corona Station and Hotel are discussed. In 1979, a portion of the auto road over Corona Pass was permanently closed because of a cave-in of the "Needle's Eye," a tunnel located before the trestles heading west from the Moffat Tunnel's East Portal. The tunnel reopened on July 3, 1988, thanks to efforts of the Rollins Pass Restoration Association on both sides of the Divide, with the cooperation of the U.S. Forest Service, Colorado History Society, and Boulder, Grand, and Gilpin Counties. It then closed once more when another rockfall hit the tunnel on July 15, 1990. The RPRA is continuing its efforts for re-opening. The noted photographer, Charles McClure, took many outstanding photos of the Rollins Pass road. One, titled"Group on Rollins Pass, shows well-dressed men and women stand on a snowfield making snowballs on Rollins Pass, Moffat Road, Boulder or Grand County, Colorado; probably on Denver, Northwestern and Pacific excursion train. Date: between 1904 and 1913 near Corona Station." Another photo shows a "30 ft. snowcut on Rollins Pass, Moffat Road photo. Denver and Salt Lake Arrow passenger car is parked east of Corona snowshed by the thirty foot snowbank cut, Rollins Pass, Colorado; it shows men, women and railroad employees posed behind train, on the roof and on the snowbank and a standard gauge track. Date: between 1904 and 1915." A sign at the highway turn onto the Moffat roadbed says: The Moffat Road "Hill Route" Also called "Corona Pass Road", this road over the Continental Divide was the original "Hill Route" of the Denver, Northwestern & Pacific Railway built by David H. Moffat in 1903. It crosses Rollins Pass at 11,666 feet elevation. On top of Rollins Pass, a sign says: Elevation 11, 660 feet, John Quincy Adams Rollins established a toll wagon road through this pass in the mid 1870's. David H. Moffat's Denver, Northwestern & Pacific Railway crossed the Continental Divide at this point in 1903. First known as Boulder Pass, then Rollins Pass, the railroad workers dubbed it "Corona", the crown of the "Top of the world." A railroad station, hotel, restaurant and workers' quarters existed here until 1928 when the railroad was abandoned due to the building of the Moffat Tunnel. Identifications in various trail and geographical guides say: Rollins Pass (el. 11,680 ft) is a high mountain pass in the Rocky Mountains of north-central Colorado in the United States. The pass is located on the continental divide at the crest of the Front Range southwest of Boulder, at the boundary of Grand County,Colorado and Boulder County, Colorado. Rollins Pass (a.k.a. Corona Pass) sits approximately 5 miles east and above the popular ski areas around Winter Park, between Winter Park and Rollinsville. The pass is traversed by an unpaved road, mostly the former roadbed of the Denver and Salt Lake Railway which abandoned the route in 1928 when the Moffat Tunnel opened to replace it. Railroad advertising called this the "Top O' the World" and it referred to the Moffat Route over the continental divide and the Rocky Mountains. Rollins Pass was the primary travel route west from Denver until an easier road over Berthoud Pass was constructed. The Denver, Northwestern and Pacific railroad laid its tracks across the pass in 1903-1904 and established a Depot at Corona on the crest. It can be noted that in R.C. Black's Island in the Rockies, the term "Corona Pass" was mentioned one time, on p. 351; the terms "Corona Station" or "Corona Snowsheds were used. In Dismantling the Rails That Climbed, Rollins Pass was used, the Corona hotel, and just once, Corona Pass; 1936. In Maggie By My Side, it was Boulder Pass and Rollins Pass. In Rails that Climbed, Rollins Pass, the Corona shed, weather at Corona, Rollins Pass Snow Shed, other references to Corona as a site. In Guide to the Colorado Mountains (Orme) , they speak of the Corona Trail to Rollins Pass. High Country Names (Ward) used Rollins Pass entirely. Only Hiking Grand County, Colorado, published 2002 by Carr speaks of Corona Pass, with reference to Rollins Pass (near the town of Corona), Moffat Road. The term "town" might be questionable; there was only a small restaurant, workers quarters, railroad offices, and in 1913, the hotel. Current maps, USFS and the Grand County Trail Map, show Rollins Pass, with Corona at the side as being a site. The use of "Corona Pass' seems to be a rather recent innovation that has come into being with tourism efforts in the upper Fraser Valley. Rollins Pass From Island in the Rockies p. 45 Rollins Pass was originally known as Boulder Pass, first recorded being crossed by whites, by Capt. Jacob Bonesteel in April 1862. Their supplies were carried in wagons. A second organized party went over the same pass in 1865. In 1866, promoters of access into Grand County brought many wagons and livestock over Boulder Pass.In 1867, Samuel Bowles and a group returned home to Denver via Boulder Pass. In 1873-74, two roads were proposed into the county, one of Berthouds pass and one over Boulder Pass. This was the same time that the county was named "Grand". J..A Rollins and his associates started the road and reached the top of the pass in 1873, at which time they envisaged a road from HSS into Utah. The first wagons went over in June 1874. The western descent was so bad that it never was much patronized by wheeled vehicles, instead becoming primarily used for trailing of cattle. At this time the name Boulder Pass disappeared from maps and Rollins Pass became the official name. p. 85. p. 80 Lots of schemes to build roads into GC, but of all the schemes for transport, only one, the Rollinsville and Middle Park Wagon Road showed any promise. That was designed by John Quincy Adams Rollins, from NH, a gifted promoter, a son of a clergyman, second of 19 children. He was a farmer, miner, freighter, road bulder, and platter of towns. He was perhaps the most accomplished billiard player west of the Mississippi. He was a Colorado resident at least by 1866. His finances were up and down, but he was tremendously strong. In December 1884, when he was 68, he thought nothing of a 3-day snow-clogged crossing of the Continental Divide. p. 85 Rollins was interested in MP as an investor and he was interested in extending his road into Utah. David Moffat and Horace Sumner, his chief engineer, in the fall of 1903, were planning the tunnel for future excavation; but in the meantime a temporary line was planned for crissing Rollins Pass, at 11,640 feet. p. 264 A formal contract was let for the work over Rollins Pass in August 1903. The loftiest sections were started first, and the first cuts at the top were nearly finished by the 26th of October and tunneling started at Riflesight Notch. As snow came, work slowed to a standstill. p. 265 Work in 1904 was extremely slow until the end of August. An encampment was built at Arrowhead and a station at the crest of the Divide was named Corona Station, where long snow sheds were built almost immediately. p. 267 Arrowhead was soon shortened to Arrow, when a post office was opened there in 1905. Travel on the grades, at 4-5% grades up over Rollins Pass was exceedingly difficult. p. 270 In 1908, word of the scenic splendor of Rollins Pass was becoming known world wide. Also known as Rollinsville and Middle Park Wagon Road;Boulder Wagon Road;R Rollins Pass, Rollinsville Corona Station and Hotel The railroad construction town of Corona, Colorado, located at over 11,600 feet at the top Corona Pass (first called Boulder Pass) along the Continental Divide was the highest railroad station in the world. It was situated on an old Native American trail, the same trail it is believed the Mormons traveled on their way to Utah. The road was improved by the U.S. Army, then further improved in 1866 by General John Q. Rollins, for whom the pass and the town of Rollinsville were officially named. Because of the high drifts of snow, the pass was only open from around July to the first big snowstorm two or three months later. In 1956, Governor Steve McNichols presided at the official re-opening of the four percent grade to vehicle traffic over Corona Pass, expressing the hope that the route would someday be paved. The Colorado Game and Fish Department and the U.S. Forest Service made additional improvements, and the Arapaho and Roosevelt National Forests put out a 24-page booklet titled "The Moffat Road: A Self-Guiding Auto Tour." The road crossed two of the original railroad trestles near Corona but those trestles, even if reached by 4-wheel vehicles, are crumbling and can no longer even be crossed safely on foot. In 1979, a portion of the auto road over Corona Pass was permanently closed because of a cave-in of the "Needle's Eye," a tunnel that came before the trestles on a westward drive from the Moffat Tunnel's East Portal area. The tunnel reopened on July 3, 1988, thanks to the efforts of the Rollins Pass Restoration Association with the cooperation of the U.S. Forest Service, Colorado History Society, and Boulder, Grand, and Gilpin Counties. It was then closed once more when another rockfall hit the tunnel on July 15, 1990. John K. Aldrich is a geologist, lecturer, and author whose "Ghosts of . . . " books and accompanying topo maps are a boon to hobbyists, explorers, and those interested in Colorado mining history. Date: 02/04/08 05:13 Rollins Pass Milepost 16 Corona Station. Picture 6 below, is DPL photo X-7388. "Title: Corona, Colorado, interior of snowshed. Summary: Passengers stand next to the covered train depot at Rollins Pass, in Corona (Grand County), Colorado. The tracks of the Denver, Northwestern & Pacific Railway are in the foreground. The depot is constructed of logs, and the roof of the snowshed is upheld by timbers. Sunlight streams through the opening at the end of the snowshed. Date: (between 1904 and 1913). Source: E. T. Bollinger from W. I. Hoklas." Picture 7 below, is DPL photo MCC-454A. "Title: Group on Rollins Pass. Summary: Well dressed men and women stand on a snowfield making snowballs, Rollins Pass, Moffat Road, Boulder or Grand County, Colorado; probably on Denver, Northwestern and Pacific excursion train. Date: (between 1904 and 1913). Creator: Louis Charles McClure 1867-1957. Picture 8 below, is DPL photo MCC-624. "Title: 30 ft. snowcut, Rollins Pass, Moffat Road photo. Summary: Denver and Salt Lake Arrow Turn (passenger car) parked east of Corona snowshed by thirty foot snowbank cut, Rollins Pass, Colorado; shows men, women and railroad employees posed behind train, on roof and on snowbank and standard gauge track. Date: (between 1904 and 1915 The highway sign says The Moffat Road "Hill Route" Also called "Corona Pass Road", this road over the Continental Divide was the original "Hill Route" of the Denver, Northwestern & Pacific Railway built by David H. Moffat in 1903. It crosses Rollins Pass at 11,666 feet elevation. On top of Rollins Pass, a sign says: Rollins Pass Elevation 11, 660 feet John Quincy Adams Rollins established a toll wagon road through this pass in the mid 1860-s. David H. Moffat's Denver, Northwestern & Pacific Railway crossed the Continental Divide at this point in 1903. First known as Boulder Pass, then Rollins Pass, the railroad workers dubbed it "Corona", the crown of the "Top of the world." A railroad station, hotel, restaurant and workers' quarters existed here until 1928 when the railroad was abandoned due to the building of the Moffat Tunnel. Rollins Pass Elevation 11,680 ft (3,560.1 m) Traversed by Unpaved road Location Boulder_County,_Colorado / Grand,Colorado Rollins Pass (el. 11,680 ft) is a high mountain pass in the Rocky Mountains of north-central Colorado in the United States. The pass is located on the continental divide at the crest of the Front Range southwest of Boulder at the boundary of Grand_County,_Colorado and Boulder County. Sign that sits on top of Rollins Pass Rollins Pass (a.k.a. Corona Pass) sits approximately 5 miles east and above the popular ski areas around Winter Park, between Winter Park and Rollinsville. The pass is traversed by an unpaved road, mostly the former roadbed of the Denver and Salt Lake RailwayDenver_and_Salt_Lake_Railway which abandoned the route in 1928 when the Moffat Tunnel opened to replace it. Rollins Pass Railroad advertising called this the "Top 'O the World" and it referred to the Moffat Route over the continental divide and the Rocky Mountains. Rollins Pass was the primary travel route west from Denver until an easier road over Berthoud Pass was constructed. The Denver, Northwestern and Pacific railroad laid its tracks across the pass in 1903-1904 and established a Depot at Corona on the crest. David Moffat planned to replace the "Hill Line" with a tunnel through James Peak within a few years of the railroad construction. However, he never could obtain financing for the tunnel due to the inability of the railroad to make a profit and opposition from competing railroads such as the Denver and Rio Grande. The D&RG saw the line as a threat. But, in the far future the construction of Moffat Tunnel would turn out to be the D&RG's saving grace. The trip up Rollins Pass was a favorite of summer tourists looking to enjoy the mountain scenery. It was heavily promoted by the railroad with picnic and wildflower picking excursions. Sights along the line were made famous by postcards containing the photos of L. C. McClure. At last the route surmounts the crest of the Continental Divide and takes quick refuge on the top at Corona. At elevation 11, 660 this is truly the famous Top O' the World and one of the highest railroad passes in the world. Due to the great height and nature of the Rocky Mountains, the entire railroad complex was completely enclosed in giant covered snow sheds. Travel across various passes of the Continental Divide occurred long before white men showed up. Indeed, as anthropologist James Benedict wrote c. 1975, some 10,000 years ago, prehistoric Indians camped, hunted, and built hunting walls on the upper reaches of Rollins Pass, as well as moving in and out of Middle Park for the warm summer months. Historic Indians followed the same paths. In the earliest days of non-Indian access, a particular pass at the head of Boulder Creek was dubbed Boulder Pass. Capt. Jacob Bonesteel, including wagons, made the first recorded crossing by a white man at this point in April 1862. Three years later, a group of Mormons brought wagons over this route and a year later, promoters of new roads into Middle Park brought in many wagons and livestock. In fact, tourists were starting to enter the park by a number of routes, and one of them, Samuel Bowles, who wrote a fascinating account of his trip, including his return to Denver via Boulder Pass. Interest was growing rapidly for a road over the Divide, into Hot Sulphur Springs, and on into Utah. One promoter, John Quincy Adams Rollins, from New Hampshire, teamed up with William N. Byers and Porter M. Smart to carry this project through. Rollins was interested in crossing the Divide; Byers was promoting the Springs; Porter wanted to develop the valley of the Middle Yampa. All three were pushing to have Middle Park officially named as Grand County, a challenge finally accomplished in 1874. So Rollins and associates started his road, reaching the top in 1873. That next winter, they publicized this access and in June, Jimmy Crawford brought his family and wagons to Rollinsville and thence to Yankee Doodle Lake, ready to cross the pass now named Rollins Pass by the developer. But the road ended, and they found Rollins' men still hacking the road out of the granite! Jimmy and his crew found it necessary to leave their wagons and help. Finally, on June 10th, the family was able to head for the top. Jimmy borrowed two yokes of oxen, hitching them to mules, and then to his horse. The road was so rough that the procession could proceed but a few feet before having to rest. The family itself climbed on foot. At the summit, they discovered only a rough swath cut down through the trees on the western side. The "road" dropped down between the lakes and followed Ranch Creek to its junction with the Fraser River. Rollins quickly realized that Berthoud Pass, which also opened in 1874, was superior to his own pass for wheeled vehicles, so he determined to hedge his bets. He initiated the first mail service into the county in 1873. He also built a commodious hotel where his road joined the Berthoud Pass road at the confluence of Crooked Creek and the Fraser. He called it the Junction House. Next, he proposed to the builders of Berthoud Pass that they form a joint ownership of the two roads between Junction Ranch and the Springs. Tickets would be issued for both routes and revenues would be shared. The two companies would build a bridge over the Grand at Hot Sulphur Springs. He even buttered up his rivals by complementing their work. All this was accomplished, although the mail route soon moved to Berthoud Pass, because of the severe winters on Rollins Pass. The bridge was started in November 1874. From the beginning, Rollins' road was preferred for trailing livestock, because there were fewer problems with heavy timber and bogs. For years, the Church brothers, George and John, who introduced the Hereford breed into the county, trailed their cattle for summering in what became known as Church Park. 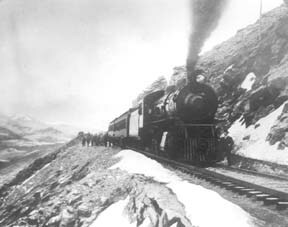 However, tourists such as Irving Hale still drove wagons over Rollins Pass in 1878. About 1880, interest burgeoned for bringing a railroad up South Boulder Canyon and through a tunnel near Rollins Pass. Numerous surveys were completed all along the area. David Moffat settled on Rollins Pass for the tunnel site but decided first to put a temporary line over the top. Thus, in the summer of 1903, a formal contract was let for work up and over the Pass itself. By 1904, the workers reached Arrowhead and they also built a work station on top, called Corona Station, or "crown of the mountain." This railroad construction town of Corona, located at over 11,600 feet at the top of Rollins Pass (first called Boulder Pass) along the Continental Divide was the highest railroad station in the world. It became obvious by 1905 that the Corona area would require snowsheds if trains were to travel, even irregularly, during the winter. Still, word got out of the spectacular splendor of Rollins Pass and tourists flocked in on summer train excursions, sometimes stopping on top, sometimes going as far as Arrow. In 1913, a fine hotel was built next to the rail facilities. Because Rollins Pass was right in the middle of severe weather patterns, a weather station was built on top, as well as one down at Sunnyside. In 1915, Rollins Pass was actually proposed to be the south boundary of a proposed "Estes National Park." Later, on the National Historic Register, the district was listed in 1997 as the Denver, Northwestern and Pacific Railway Historic District--Rollinsville & Middle Park Wagon Road. It was also identified as the Rollinsville and Middle Park Wagon Road; Boulder Wagon Road, Rollins Pass, and Rollinsville area. In 1956, Governor Steve McNichols had presided at the official re-opening of the four percent grade to vehicle traffic over Corona Pass, expressing the hope that the route would someday be paved. The Colorado Game and Fish Department and the U.S. Forest Service made additional improvements, and the Arapaho and Roosevelt National Forests put out a 24-page booklet titled "The Moffat Road: A Self-Guiding Auto Tour." The road crossed two of the original railroad trestles near Corona but those trestles, even if reached by 4-wheel vehicles, were crumbling and could no longer even be crossed safely on foot. The current self-guided auto tour refers to Rollins Pass, as well as the Moffat Road and the Boulder Wagon Road. Corona Station and Hotel are discussed. In 1979, a portion of the auto road over Corona Pass was permanently closed because of a cave-in of the "Needle's Eye," a tunnel located before the trestles heading west from the Moffat Tunnel's East Portal. The tunnel reopened on July 3, 1988, thanks to efforts of the Rollins Pass Restoration Association on both sides of the Divide, with the cooperation of the U.S. Forest Service, Colorado History Society, and Boulder, Grand, and Gilpin Counties. It then closed once more when another rockfall hit the tunnel on July 15, 1990. The RPRA is continuing its efforts for re-opening. The noted photographer, Charles McClure, took many outstanding photos of the Rollins Pass road. One, titled "Group on Rollins Pass, shows well-dressed men and women stand on a snowfield making snowballs on Rollins Pass, Moffat Road, Boulder or Grand County, Colorado; probably on Denver, Northwestern and Pacific excursion train. Date: between 1904 and 1913 near Corona Station." Another photo shows a "30 ft. snowcut on Rollins Pass, Moffat Road photo. Denver and Salt Lake Arrow passenger car is parked east of Corona snowshed by the thirty foot snowbank cut, Rollins Pass, Colorado; it shows men, women and railroad employees posed behind train, on the roof and on the snowbank and a standard gauge track. Date: between 1904 and 1915." A sign at the highway turn onto the Moffat roadbed says: The Moffat Road "Hill Route" Also called "Corona Pass Road", this road over the Continental Divide was the original "Hill Route" of the Denver, Northwestern & Pacific Railway built by David H. Moffat in 1903. It crosses Rollins Pass at 11,666 feet elevation. On top of Rollins Pass, a sign says: Elevation 11, 660 feet, John Quincy Adams Rollins established a toll wagon road through this pass in the mid 1870's. David H. Moffat's Denver, Northwestern & Pacific Railway crossed the Continental Divide at this point in 1903. First known as Boulder Pass, then Rollins Pass, the railroad workers dubbed it "Corona", the crown of the "Top of the world." A railroad station, hotel, restaurant and workers' quarters existed here until 1928 when the railroad was abandoned due to the building of the Moffat Tunnel. Identifications in various trail and geographical guides say: Rollins Pass (el. 11,680 ft) is a high mountain pass in the Rocky Mountains of north-central Colorado in the United States. The pass is located on the continental divide at the crest of the Front Range southwest of Boulder, at the boundary of Grand County, Colorado and Boulder County, Colorado. Rollins Pass (a.k.a. Corona Pass) sits approximately 5 miles east and above the popular ski areas around Winter Park, between Winter Park and Rollinsville. The pass is traversed by an unpaved road, mostly the former roadbed of the Denver and Salt Lake Railway which abandoned the route in 1928 when the Moffat Tunnel opened to replace it. Railroad advertising called this the "Top O' the World" and it referred to the Moffat Route over the continental divide and the Rocky Mountains. Rollins Pass was the primary travel route west from Denver until an easier road over Berthoud Pass was constructed. The Denver, Northwestern and Pacific railroad laid its tracks across the pass in 1903-1904 and established a Depot at Corona on the crest. It can be noted that in R.C. Black's Island in the Rockies, the term "Corona Pass" was mentioned one time, on p. 351; the terms "Corona Station" or "Corona Snowsheds were used. In Dismantling the Rails That Climbed, Rollins Pass was used, the Corona hotel, and just once, Corona Pass; 1936.
hat was designed by John Quincy Adams Rollins, from NH, a gifted promoter, a son of a clergyman, second of 19 children. He was a farmer, miner, freighter, road bulder, and platter of towns. He was perhaps the most accomplished billiard player west of the Mississippi. He was a Colorado resident at least by 1866. His finances were up and down, but he was tremendously strong. In December 1884, when he was 68, he thought nothing of a 3-day snow-clogged crossing of the Continental Divide. p. 85 Rollins was interested in MP as an investor and he was interested in extending his road into Utah.. At the same time, a Porter M. Smart was likewise excited about speculating in frontier projects and was working at developing the valley of the Middle Yampa. William N. Byers was busy planning for HSS. These three men launched at least two petitions, with more than 80 "residents" for creating GC. Grand County was created that year, 1874. p. 89 With the creation of GC, people began to consider the area more seriously. p. 92 There was no official mail into the county until 1873 when Rollins brought in the first US pouch over his pass. In May 1874, he built a commodious hotel at the confluence of Crooked Creek and the Fraser, known as the Junction House. p. 94 Rollins knew that the road over Berthoud Pass was superior to Rollins Pass; his main advantage was the railhead at Blackhawk. So Rollins proposed a joint ownership and operation of the two roads for the line between Junction Ranch and HSS. Tickets would be issued for both routes and revenues would be shared. The two companies would build a bridge across the Grand at HSS. Rollins even complimented the Berthoud work. This merger was completed soon. p. 104 This bridge was started in November 1874. p. 108 A mail contract was made in July 1875 for once a week delivery over Rollins Pass, but conditions were so severe that the route was changed to Berthoud Pass. 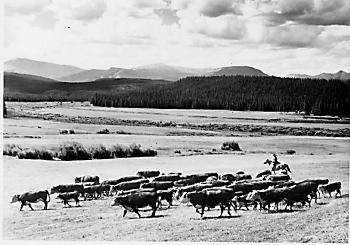 p. 110 From the beginning, Rollins Pass was used in preference to Berthoud Pass for trailing livestock, because there were fewer problems with timber and bogs. However, late spring snowdrifts were a problem, so 20-30 horses were often brought along to break trail. The Church brothers, ?George and John, summered their cattle in what became known as Church Park and dug the Church Ditch. They also introduced the celebrated Hereford breed into GC. p. 170-171 As interest in bringing a railroad into and through GC developed, about 1880, various stockholders proposed to build up South Boulder Canyon to Yankee Doodle Lake and start a tunnel near Rollins Pass. Nothing came of the first attempts but by the end of July 1881, numerous surveys had been made for that tunnel. p. 238 Cattle was still being trailed out via Rollins Pass up to the turn of the century. p. 258 David Moffat and Horace Sumner, his chief engineer, in the fall of 1903, were planning the tunnel for future excavation; but in the meantime a temporary line was planned for crissing Rollins Pass, at 11,640 feet. p. 264 A formal contract was let for the work over Rollins Pass in August 1903. The loftiest sections were started first, and the first cuts at the top were nearly finished by the 26th of October and tunneling started at Riflesight Notch. As snow came, work slowed to a standstill. p. 265 Work in 1904 was extremely slow until the end of August. An encampment was built at Arrowhead and a station at the crest of the Divide was named Corona Station, where long snow sheds were built almost immediately. p. 267 Arrowhead was soon shortened to Arrow, when a post office was opened there in 1905. Travel on the grades, at 4-5% grades up over Rollins Pass was exceedingly difficult. 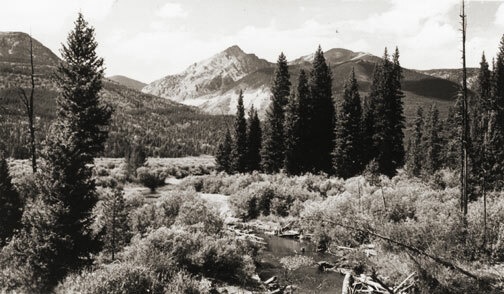 p. 270 In 1908, word of the scenic splendor of Rollins Pass was becoming known world wide. Also, Rollins Pass and its "Corona station" were attracting the attention fo the US Weather Bureau, for the pass lay squarely in the center of the region of heaviest snowfall on the entire Colorado Continental Divide. p. 344 A terrible winter in 1909 made people think that Rollins Pass was never going to be practical for the long term. Time and again freight and passengers were stuck on top at the Corona facility. In 1913, a $10,000 hotel was built at Corona next to the rail facilities. From Dismantling the Rails That Climbed p. 6 The railroad went from Denver to the top of Rollins Pass. p. 8 Snowsheds were built over the tracks at Corona and other strategic places in 1905. p. 12 The top was referred to as "Corona Pass" 1936. p. 16 Crews who were to removed tails and ties reached Corona at the top of Rollins Pass 1936. p. 20 Reference to the Corona hotel From Maggie By My Side p. 1 Jimmy Crawford heard that a man named John Quincy Adams Rollins was building a road over the range at a place called Boulder Pass. 1873 p. 9-14 June 1874 The Crawford family traveled to Rollinsville and then to Yankee Doodle Lake, where the road ended. Rollins' men were still hacking the road out of the granite. Jimmy and his crew helped. On the morning of June 10, the family started out to go over the rocks and up the mountain. Then he borrowed two yokes of oxen to his wagon, then mules, then his horse. The animals had to rest every few feet; the family climbed on foot. There was no shelter at the top. Rollins' men had done no work yet on the west side of the pass except to cut a rough swath down through the trees. The road dropped down along Ranch Creek. From Rails That Climb published 1950 p. 43 Leyden Junction to Tolland to Rollins Pass. P. 63-64 Many references to Tunnels as identifiers of location. p. 76-77, 78 reference to the old Rollins Pass toll road; first mention of the place called Corona- crown of the mountain. Most references are to Rollins Pass. The Corona shed is mentioned, p. 82. p. 83 Sunnyside water stop, Loop Trestle and Tunnel, Ranch Creek Trestle and water stop, Arrow. p. 95, 100- 101 It is eleven miles from Arrowhead to Rollins Pass. Rollins Pass-Boulder wagon road; other references p. 107 - 112 reference to Corona shed. Reference to pipe line to Corona; a number of comments to Rollins Pass p. 119 weather at Corona p. 120-121 Rollins Pass p. 151 Rollins Pass p. 182 photo of "Rollins Pass Snow Shed" "This Corona station burned one night." p. 188 photo of June at Rollins Pass p. 192-194 photos of Corona shed and other buildings; Rollins Pass p. 252 walking on top of snow shed at Corona p. 271- 272. 1910 Snowshed at Corona p. 312-314 Rollins Pass; Rollins Pass snowshed; Corona; Corona siding p. 324 Corona; Sunnyside weather report station p. 326 Corona sheds p. 333-335 Corona shed; references to "Corona" as a place From Guide to the Colorado Mountains published 1974 p. 54-55 Corona Trail, going from East Portal to Rollins Pass From High Country Names published 1972 p. 105 Irving Hale in 1878 drove his wagon over Rollins Pass, now nearly abandoned as a wagon road. p. 131 David Moffat decides to build a temporary line over Rollins Pass. p. 165 In 1915, Rollins Pass was proposed to be the south boundary of a proposed "Estes National Park". From Hiking Grand County, Colorado published 2002 p. 52 Trailhead on the "Moffat Road to Corona Pass". In same paragraph, it becomes Rollins Pass (near the town of Corona). On p. 54, reference to the Corona Road. On p. 57, map shows Rollins Pass with Corona marked as a "site." p. 56, reference to the old railroad bed used crossing the Divide at Rollins Pass, near the town of Corona. Sometimes called Corona Pass. p. 60-61 Rollins Pass Wagon Road historical notes on JQA Rollins and how to find his wagon road over Rollins Pass, following Ranch Creek to Tabernash. p. 66 Rollins Pass (Corona) to Devil's Thumb From GCHA Journal The Journey p. 6 Rollins Pass used by Indians; comment in 1981 From GCHA Journal Middle Park Indians to 1881 p. 8 Archaic hunters camped in the Rollins Pass area; written mid-1970's The current maps, USFS and Grand County Trail Map, show Rollins Pass with Corona at the side as being a site. The Rollins Pass Restoration Association for many years, and currently, has been trying to open the road and Needles Eye Tunnel. The self-guided auto tour refers to Rollins Pass, as well as the Moffat Road and the Boulder Wagon Road. Corona Station and Hotel are discussed. On the National Historic Register Denver, Northwestern and Pacific Railway Historic District--Rollinsville & Middle Park Wagon Road (Boundary Increase) ** (added 1997 - District - #97001114) Also known as Rollinsville and Middle Park Wagon Road;Boulder Wagon Road;R Rollins Pass, Rollinsville Corona Station and Hotel The railroad construction town of Corona, Colorado, located at over 11,600 feet at the top Corona Pass (first called Boulder Pass) along the Continental Divide was the highest railroad station in the world. It was situated on an old Native American trail, the same trail it is believed the Mormons traveled on their way to Utah. The road was improved by the U.S. Army, then further improved in 1866 by General John Q. Rollins, for whom the pass and the town of Rollinsville were officially named. Because of the high drifts of snow, the pass was only open from around July to the first big snowstorm two or three months later. In 1956, Governor Steve McNichols presided at the official re-opening of the four percent grade to vehicle traffic over Corona Pass, expressing the hope that the route would someday be paved. The Colorado Game and Fish Department and the U.S. Forest Service made additional improvements, and the Arapaho and Roosevelt National Forests put out a 24-page booklet titled "The Moffat Road: A Self-Guiding Auto Tour." The road crossed two of the original railroad trestles near Corona but those trestles, even if reached by 4-wheel vehicles, are crumbling and can no longer even be crossed safely on foot. In 1979, a portion of the auto road over Corona Pass was permanently closed because of a cave-in of the "Needle's Eye," a tunnel that came before the trestles on a westward drive from the Moffat Tunnel's East Portal area. The tunnel reopened on July 3, 1988, thanks to the efforts of the Rollins Pass Restoration Association with the cooperation of the U.S. Forest Service, Colorado History Society, and Boulder, Grand, and Gilpin Counties. It was then closed once more when another rockfall hit the tunnel on July 15, 1990. John K. Aldrich is a geologist, lecturer, and author whose "Ghosts of . . . " books and accompanying topo maps are a boon to hobbyists, explorers, and those interested in Colorado mining history. Date: 02/04/08 05:13 Rollins Pass Milepost 16 Corona Station. Picture 6 below, is DPL photo X-7388. "Title: Corona, Colorado, interior of snowshed. Summary: Passengers stand next to the covered train depot at Rollins Pass, in Corona (Grand County), Colorado. The tracks of the Denver, Northwestern & Pacific Railway are in the foreground. The depot is constructed of logs, and the roof of the snowshed is upheld by timbers. Sunlight streams through the opening at the end of the snowshed. Date: (between 1904 and 1913). Source: E. T. Bollinger from W. I. Hoklas." Picture 7 below, is DPL photo MCC-454A. "Title: Group on Rollins Pass. Summary: Well dressed men and women stand on a snowfield making snowballs, Rollins Pass, Moffat Road, Boulder or Grand County, Colorado; probably on Denver, Northwestern and Pacific excursion train. Date: (between 1904 and 1913). Creator: Louis Charles McClure 1867-1957. Picture 8 below, is DPL photo MCC-624. "Title: 30 ft. snowcut, Rollins Pass, Moffat Road photo. Summary: Denver and Salt Lake Arrow Turn (passenger car) parked east of Corona snowshed by thirty foot snowbank cut, Rollins Pass, Colorado; shows men, women and railroad employees posed behind train, on roof and on snowbank and standard gauge track. Date: (between 1904 and 1915 The highway sign says The Moffat Road "Hill Route" Also called "Corona Pass Road", this road over the Continental Divide was the original "Hill Route" of the Denver, Northwestern & Pacific Railway built by David H. Moffat in 1903. It crosses Rollins Pass at 11,666 feet elevation. On top of Rollins Pass, a sign says: Rollins Pass Elevation 11, 660 feet John Quincy Adams Rollins established a toll wagon road through this pass in the mid 1860-s. David H. Moffat's Denver, Northwestern & Pacific Railway crossed the Continental Divide at this point in 1903. First known as Boulder Pass, then Rollins Pass, the railroad workers dubbed it "Corona", the crown of the "Top of the world." A railroad station, hotel, restaurant and workers' quarters existed here until 1928 when the railroad was abandoned due to the building of the Moffat Tunnel. Rollins Pass Elevation 11,680 ft (3,560.1 m) Traversed by Unpaved road Location Boulder_County,_Colorado / Grand,Colorado Rollins Pass (el. 11,680 ft) is a high mountain pass in the Rocky Mountains of north-central Colorado in the United States. The pass is located on the continental divide at the crest of the Front Range southwest of Boulder at the boundary of Grand_County,_Colorado and Boulder County. Sign that sits on top of Rollins Pass Rollins Pass (a.k.a. Corona Pass) sits approximately 5 miles east and above the popular ski areas around Winter Park, between Winter Park and Rollinsville. The pass is traversed by an unpaved road, mostly the former roadbed of the Denver and Salt Lake RailwayDenver_and_Salt_Lake_Railway which abandoned the route in 1928 when the Moffat Tunnel opened to replace it. Rollins Pass Railroad advertising called this the "Top 'O the World" and it referred to the Moffat Route over the continental divide and the Rocky Mountains. Rollins Pass was the primary travel route west from Denver until an easier road over Berthoud Pass was constructed. The Denver, Northwestern and Pacific railroad laid its tracks across the pass in 1903-1904 and established a Depot at Corona on the crest. David Moffat planned to replace the "Hill Line" with a tunnel through James Peak within a few years of the railroad construction. However, he never could obtain financing for the tunnel due to the inability of the railroad to make a profit and opposition from competing railroads such as the Denver and Rio Grande. The D&RG saw the line as a threat. But, in the far future the construction of Moffat Tunnel would turn out to be the D&RG's saving grace. The trip up Rollins Pass was a favorite of summer tourists looking to enjoy the mountain scenery. It was heavily promoted by the railroad with picnic and wildflower picking excursions. Sights along the line were made famous by postcards containing the photos of L. C. McClure. At last the route surmounts the crest of the Continental Divide and takes quick refuge on the top at Corona. At elevation 11, 660 this is truly the famous Top O' the World and one of the highest railroad passes in the world. Due to the great height and nature of the Rocky Mountains, the entire railroad complex was completely enclosed in giant covered snow sheds. As late as this summer, John Murphy, 94, mowed ditches on his ranch land and built a new fence. "You got to keep busy doing something," he said. His longevity, he said smiling at wife Carolyn across the table, is owed to "having a good wife to keep you healthy." Berthoud Pass Stage Road was built by the extreme efforts of Captain Lewis Gaskill. It came from the top of the Pass through Spruce Lodge, Idlewild (now Winter Park), the Cozens Ranch (near Fraser) Junction Ranch (Tabernash) and Coulter. From there once branch lead over Cottonwood Divide to Hot Sulphur Springs (and points west) while the other went to Selak’s and over Coffey Divide to the Lehman Post Office and on to Grand Lake. At the summit of Berthoud Pass there was a large house of hewn logs, occupied by Lewis Gaskill and his family. They collected the tolls for the road and gave welcome shelter to those weathering the variable passage. The house was located on the West side of current Hwy. 40 but no trace of the building remains. At the steepest portion of the west side of Berthoud Pass was the Spruce House rest stop, which by 1900 was a sold structure of two and a half stories. There the traveler could find a warm meal and corral for livestock. No trace of it remains today. The Idlewild Stage Stop was located in present day Winter Park and was a popular place to change horses before the steep assent up the pass. Mrs. Ed Evans served a hearty noonday meal there for only 35 cents. Cozens Ranch was also one of the more popular stops and Fraser Post Office until 1904. Built around 1874 by William Zane Cozens, it remains today, outfitted in period décor and is the home of the Cozens Ranch History Museum. The Gaskill House, in Fraser was built by Lewis De Witt Clinton Gaskill, one of the original investors in the road and a prominent Grand County citizen. The house now houses the Hungry Bear Restaurant. Junction House at Junction Ranch (Tabernash) could accommodate up to fifty travelers and was built by Quincy Adams Rollins, and subsequently leased to Johnson Turner. The Coulter Stage Stop was built by John Coulter, an attorney from George town and shareholder in the stage road. It also served as a Post Office from 1884 to 1905. Frank and Fred Selak, sons of a pioneer Georgetown brewer ran the Selak stop which was north of Granby and east of current Hwy. 34. Cottonwood Divide (Pass), at 8904 feet above sea level, was laid out by Edward Berthoud and Redwood Fisher in 1861. The route was used by stagecoaches from 1874 until the railroad arrived at Hot Sulphur Springs in 1905. The last driver on the route was Charlie Purcell. Summer travel time between Hot Sulphur Springs and Georgetown was typically twelve hours. Travelers between Hot Sulphur Springs and Kremmling could stop at the Barney Day or King Ranches, both near current Hwy. 40. The Pinney Ranch House, used by the firm of Whipple and Metcalf for the connecting service to Steamboat Springs, is still standing on Hwy. 134 on the east slope of Gore Pass. There a traveler could pay 50 cents for a meal, 50 cents for a bed and expect a change of horses every ten miles. It ceased operation in 1908 when the railroad reached Toponas. William Jefferson (Wm./W.J./Bill) Thompson was born on March 26, 1849 in Aurora Township, Preston County, Virginia (1863-West Virginia). The 8th child of 9 children of Wm. & Mary Anne (Wotring) Thompson. His father was a shoemaker at the Wotring Tannery and died in 1853. Mrs. Thompson left Preston County in September 1859 with her children on a covered wagon for Oregon. They arrived at St. Charles, Iowa around Christmas, settling at New Virginia, joining other relatives. Wm. may have been taken captive by Native Americans prior to entering Colorado Territory. Via ox cart he came to Central City to start mining in 1865. He ventured into adjacent Middle Park, seeking gold in the Troublesome Valley, supplied with 1 ton of flour. He spent four years as a postal carrier from Hot Sulphur Springs to Steamboat Springs, using the Gore Pass route. Once, the Ute Indians saw him baking biscuits and they enjoyed the “beescuts” until the flour ran out. An altercation left Wm. severely beaten. He made his way to Georgetown and the miners denied him entry, thinking he was a crazy man. One kind miner gave Wm. canvas for clothing, and took him to Idaho Springs. He recovered and was employed as a shoemaker. Wm. re-entered Middle Park, built a hunting cabin on Muddy Creek ready for the 1867 winter. Chief Yarmonite led 40 Ute men, women and children to Wm’s cabin explaining to him that the Gore Range was covered with snow, and they were in need of food. This time Wm. refused. A rifle match was agreed upon with the loser put to death. Wm. threw his sombrero to the ground as his hair fell to his shoulders. A cry of the Ute went up as they recognized Wm. from the Troublesome. Sub-chief Piah told Wm. they could not fight a Ute brother, and braided Wm’s hair and applied face paint as they were at war with the Arapahoes. A hunt for bison began. Shooting was heard with the thought the Arapahoes arrived. Len Pollard & Sandy Mellon were chasing buffalo, which Wm. shot and killed. Len & Sandy confronted the supposed Ute with Len asking, “Where did you get Bill Thompson’s Winchester rifle?” Wm. played along until Sandy aimed his rifle on Wm. who wisely said, “Don’t over reach yourself, Sandy.” Sandy demanded, “Who in the hell are you!” Bill laughed and told them he was Bill Thompson. The sobriquet of “Ute Bill” was given. Wm. preferred his nick name over his legal name. Ute Bill carried on as a mountaineer. Hunting and trapping, taking wild game to the Georgetown & Denver markets selling the meat, until laws prohibited the practice. A new career began of driving stagecoaches and freight wagons for the Colorado Stage Company on the Georgetown, Empire & Middle Park Wagon Road, over Berthoud Pass to Grand Lake, Hot Sulphur Springs, Gore Pass, and occasionally Steamboat Springs. One day on Cottonwood Pass, Ute Bill stopped and hiked over a ridge to find 400 Ute tipis on a meadow, imaging this could be a ranch. He homesteaded acreage, bought the home ranch from Al Honscome, and through marriage owned 4000 acres. The T Lazy S brand was patented. The Thompson Ranch was the 1st in Middle Park allowed to receive water from the Grand (Colorado) River for irrigation. Ute Bill Creek and Ute Bill Ditch 1 & 2 were also patented. Middle Park became Grand County of February 2, 1874. Ute Bill was on the first jury, appointed Road Supervisor, and a delegate to the state Democrat Party Convention. In 1879 he owned Thompson’s Billiard Hall, bought a store from John Kinsey and expanded it into Ute Bill’s Saloon in Hot Sulphur Springs. He also had a game park of tame antelope, deer, and elk. The “Texas Charley” incident of December 5, 1884 began at the saloon when Texas Charley forced Ute Bill to hand over his prized Winchester rifle. His future father in law played a role in the coroner’s inquest. January 30, 1889 The Middle Park Times listed the sale of the saloon to Billy Pharo with the quote of, “We don’t reach Denver yet but were getting there you see.” An ad in Hot Sulphur Springs complemented the sale. On December 25, 1893 Ute Bill Tompson was united in marriage to Mabel Smith. The first recorded marriage in the Hot Sulphur Springs Congregational Community Church. Mabel was the eldest daughter of Preston Henry & the late Mary Smith. Ute Bill & Mabel had 6 children Fred Charles, William Preston, John Henry, Otto Woodring, Marion Loman, and Mary Ellen. W.J. Thompson advertised in the Grand County News, January 8, 1904 Sulphur Springs and Kremmling Stage Carries Mail & Express Stage Fare, One Way $1.50 Round Trip, $2.75 In 1903-1904 The Denver, Northwestern & Pacific Railroad (D.N.P.R.R.) was buying ranchers land. Ute Bill refused to sell his for $500 and lost on appeal in District Court receiving $300. However, it was “matter of principal” that he won on, as E.A. Meredith the railroad surveyor diverted the rail bed to be placed on the other side of the Colorado River below the cliffs. As the excursion trains were passing by the Thompson Ranch on their way to the Railroad Days celebration in Hot Sulphur Springs on September 15, 1905 Ute Bill danced with joy knowing that the “Iron Horse” was NOT allowed to disturb the sacred tipi grounds of the Utes! Ute Bill forgot his grievances and presided over a vast fish fry and barbeque of elk on July 4, 1906. The last cattle trail drive out of Grand County was conducted by 2 aged pioneers, Sam Martin of Muddy Creek, and Ute Bill in 1923. Another matter of principal to avoid paying railroad costs, but of great sentimental value of all the past cattle trail drives. Ute Bill & Mabel both entered St. Luke’s Hospital in Denver for surgery in late February 1926. Ute Bill’s first surgery went well, the second did not. Mabel was not able to be with him as she was recovering from her own. Many Middle Park pioneers visited them to wish them well. Old friend Charles Nines Sr. who retired in Denver from Pine Ridge Agency, South Dakota a Sioux language interpreter and Trading Post owner was with Ute Bill when he passed away on March 19, 1926, one week shy of his 77th birthday. William Jefferson “Ute Bill” Thompson is buried in the Hot Sulphur Springs Cemetery off of Cottonwood Pass, Looking at Elk Mountain and the original homestead. During the summer of 1960, Jeff E. Fuller and Don Drake formed Mountain Services Inc. to offer Grand Lake shore owners protection by patrolling the properties. In May of 1961, Don Drake promoted the idea of a fireboat and with donations, a 1960 18 foot Buehler Turbocraft Jet 56 was purchased and equipped to fight fires. Don tested the water jet and found that it would pump enough water to reach the fourth story of the five story-14 bedroom Oscar Malo home. Ironically, on September 10, 1961, that very home caught on fire. The home was completely engulfed by the time Don got the fireboat to the location but, with the help of Elmer Badger and Jerry Gruber, they concentrated on the 4-slip boathouse. The heat was so intense it melted the plastic trim on the fireboat but the boathouse was saved and still stands today. Grand County is home to the headwaters of the famed Colorado River - the river that brings water to five other arid Western states. Water is the lifeblood of semi-arid Colorado and Grand County is one of the most water-rich areas of Colorado, and yet faces a shortage due to historical water agreements, written long before population pressures and the environmental awareness of the current age. On average, the water diversion projects in the county move a whopping 305,000 acre-feet per year from the Fraser, Colorado and Williams Fork rivers - all headwaters of the Colorado's main stem. 60 percent of the water in Grand County is diverted elsewhere and there are plans underway, mostly from Front Range communities, to divert as much as 80 percent of the county's headwaters by the year 2010. Two of the main water utilities, Denver Water and the Northern Colorado Water Conservancy District face a quandary: how to take the water from Grand County without further damaging the delicate environment and the region's economy, which is fueled by tourists who expect to play in the very water the Front Range wants to take. There is a great deal of evidence of primitive cultures in what is now Grand County, but all seems to have been transient until the modern tribes arrived, probably around 1450. The Arapaho Tribe claimed the northern part of this region and were in frequent territorial dispute with the Ute Tribe, who were dominate in the Colorado Rockies. The Utes did not have “chiefs” in the sense of the organized Plains Indians. There were five different tribal groupings in Colorado, and those in the Grand County area were known as the “White River Utes”. The Uncompahgre Utes lived in the southern area of the state, near the San Juan Mountains. Their spokesman to the white man was Ouray, and because of his knowledge of Spanish and some English, the federal negotiators designated him “Chief of All Utes”. Thus it was he, who in 1868 agreed that most of the land west of the 107th degree longitude (about one third of Colorado) would be a Ute Reservation “for all time”. Ouray probably never knew the Utes of the northern region and they were never notified officially of this treaty. Suddenly, their favored hunting grounds of Middle Park, the healing waters of Hot Sulphur Springs, and much of the Front Range and Gore Range were opened to white settlement. Naturally there were tensions between the Utes and the white settlers and there are several well documented accounts of disputes in the area, including the killing of Tabernash, retaliatory strikes by the Utes, and the supposedly intentional burning of Middle Park by Colorow. Finally, there was an uprising in 1879, known as the Thornburg and White River Massacres, and the result was that the Utes were evacuated from almost all of their former reservation and driven to the Utah area in 1882. Though much of the culture, knowledge and influence of the original Indian people has been lost to time, Ute and Arapaho names still grace many landmarks in Grand County.